Home » Generations / Classics » Universe Classics 2.0 » Thunderwing Remolded – Japanese Black Shadow? Energon Megatron or Galvatron? Thunderwing Remolded – Japanese Black Shadow? Energon Megatron or Galvatron? It is slowly becoming the norm that the latest news on future remolds of Transformers figures can be found by checking out the original version’s instruction booklet! 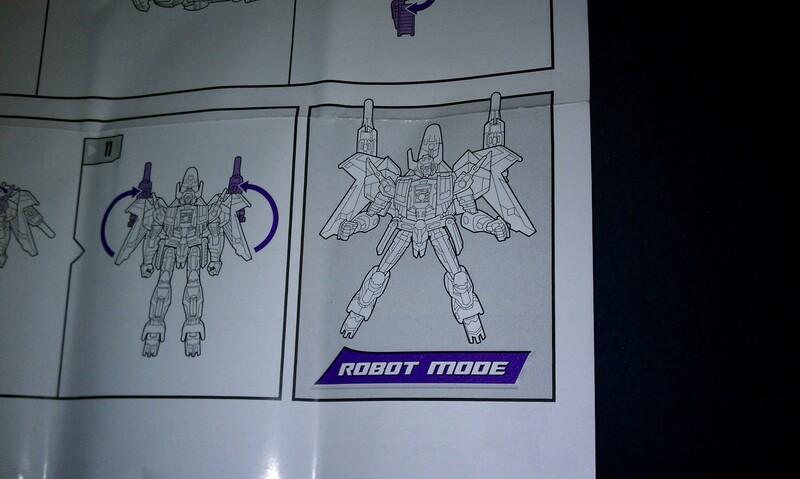 Thanks to pictures of the upcoming Thunderwing figure’s instruction booklet, we see a the figure with a newly remolded head. Some have stated that the head resembles Black Shadow, the Japanese version of the original Thunderwing figure. The head sculpt does seem to be an exact match for that figure. Others believe it is possible that it is an Energon Megatron or Galvatron homage. But the head sculpt is pretty much an exacth match for Black Shadow. Is it still possible to get a Artfire repaint out of inferno? That would be awesome!!!!!! Wouldn't that just be Inferno with a while chest? I'd rather see a Hotspot from that mold! Er… how does a tilt-cab look anything like a peterbilt? Or a half-track like a microscope? I could go on, but you get the picture. The variation on the jet-mode wings is irrelevant. The fact is, Terradive looks eerily similar to Hellbat in robot mode… the lean proportions, the shape of the head, and the peculiar chest formation. and one especially wonders about the Cybertronian Prime, Soundwave, and Megatron, we already have confirmed Bumblebee becoming Cliffjumper. Soundwave may become Blaster but that would be kinda weak. Good questions… I was wondering the same thing about Wreck Gar, Scourge, and Kup… though at the same time, Hasbro seems to be dusting off some pretty obscure characters, so it really could be anyone. Not even sure if that's a good thing. Would I be excited about a Generations Vroom or Windsweeper? Probably not so much. As for the WFC stuff, Hasbro did say that they weren't planning on doing any more figures after Cliffjumper, though it does seem hard to believe they're not going to flog some repaints. Someone in Radicons already did a really nice Hound from WFC Soundwave. Plus, Hasbro would be nuts not to capitalize on the popularity of that game by bringing some of the sweet game designs into plastic form. Looking at the option head in his instruction manual, I'm going with Vortex. It's not an exact match, but it's close enough, considering it's a "movie" style bot. But I agree about Whirl. Hooray for Obscure Japanese charactors! I freaking love the idea of Thunderwing's redeco into BlackShadow, all of you I command you, go forth and buy lots of Black Shadow. if he sells well we may get more Victory charactors, maybe even a new Star Saber and Deathsaurus, gasp we may even get Dai Atlas (especially seeing the screen time he gets in the IDW Drift miniseries.) More japanese Geewunners please Hasbro, the fans demand MOAR!!!! Botcon Deathsaurus and Leozack will be pleased. Black Shadow has a badass color scheme too. He can hang with my Axor and Darkmount as the Obscuricons. could this make the repaint/remolded head of tomahawk be blue bacchus then? I checked out the instructions and the remold head looks nothing like him, so probably not. I was sort of hoping for a Cloudburst, but this is cool too. Um……am I the only one who was confused by this? Classics 1 had the Henki Megs as Megatron in fugly grey and purple, which is one of my favorite Classics TF's. The Classics/Generations/Reveal The shield legends are getting a G1 gun megs. Classics 1 had the Henki Megs as Megatron in fugly grey and purple, which is one of my favorite Classics TF's. The Classics/Generations/Reveal The shield legends are getting a G1 gun megs. I am praying this is not a Megs, and I don't think it is, as the face and chest are spot on Dark Shadow. Jazz as Deadend? Fracks yes! FTW!!! Whoa… Yeah. If we were to get a Generations Nightbeat, we could potentially get Minerva, too. Man, I've been wishing I had ridiculous amounts of money so I could afford to buy a Black Shadow figure for years (along with several other rare, overseas exclusives, such as Minerva). In fact, when Hasbro showed their Generations Thunderwing photo back at Botcon, one of the first thoughts that crossed my mind was, "Too bad we'll probably never get a Black Shadow remold out of this." Thank you for proving me wrong, Hasbro. You're a lot cooler than I gave you credit for. The listing was for the United Megatron which is a re-release of the Henkei Megatron Fig. The one that wont be released in the US any time soon as it "crosses the line" for Toy Gun/Transformers. I knew that, but I also remember their being one in the US release listings… maybe my memory just serves me wrong this time.